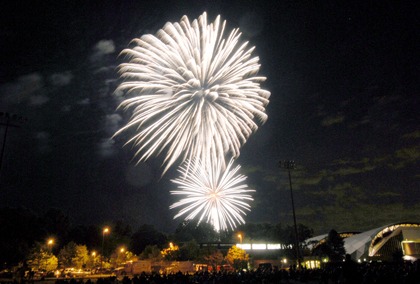 LIGHTING THE SKIES WITH THE SPIRIT OF PRINCETON: Monday's celebration of the Glorious Fourth, courtesy of the annual Spirit of Princeton Independence Day fireworks display, illuminates this July 4 issue. The weather couldn't have been better for crowds watching from fields along Western Way. A group of Princeton-based volunteers, the Spirit of Princeton also organizes the Memorial Day Parade, the Flag Day ceremony, and the Veteran's Day celebration. Princeton Borough staff updated the public last week on the stalled downtown development project that has led to growing community concern, including discreet references to the possibility of bringing in a new developer, and doubts about the municipality's ability to handle such a daunting development task. In 2005, a proposal to build a jazz club and restaurant at the site of a Bayard Lane tavern galvanized a neighborhood into opposition, and challenged the integrity of one of Princeton Township's most curious zoning districts. Now, two years later, the Township's zoning board has given the area a green light for a bank at the old tavern site, and for a 78-seat restaurant at an old service garage and car rental site just a block south. Two of New Jersey's leading arts education providers joined forces as of July 1, to create an organization that is intended to benefit the children of New Jersey. To hear bird enthusiast Steven Saffier tell it, there is no better place to observe birds than your own backyard, especially if that backyard is in the heavily wooded New Jersey, Pennsylvania region. Siding with Borough Police administration in a grievance filed by one of its own patrol officers, Borough Hall restated its position last week, denying double time pay for the officer, who had agreed to take a standby shift. As Thomas Harrington trudged up a steep section of the Great Wall of China last month, it dawned on him how far he has come in his coaching career. Catha Mullen wasn't sure where she would end up in her final season with the Princeton University women's outdoor track team. Coming into last Thursday's 11th annual Sunshine Football Classic, Brad Pietras and his mates on the West squad defense knew they faced a major challenge. Chris Petrie's moment in the sun during his freshman season with the Princeton University men's basketball team came in a romp over Rice in early January. Traditional, tempting, and tasty Thai cuisine is available at Tom Yum Goong Restaurant at 354 Nassau Street. Opened in December, it has become a popular spot for diners familiar with the savory pleasures of Thai cooking and also for those new to this dining experience. There is nothing like a new haircut and color that combine to create a style and look all your own. You walk out the door feeling like a million dollars. Refreshed, rejuvenated, and ready to go! That is the goal of B&B Hair Color Studio at 49 State Road. "I want to create a hair style that suits the woman," says Tim Bricker, owner with his wife Kate Bricker, of the salon. "A good hair cut can really give you a visual face lift."